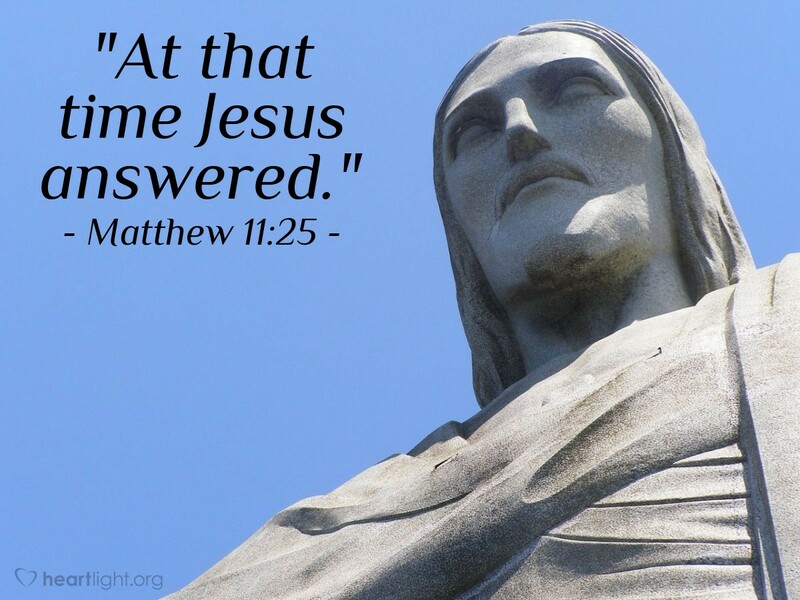 This is a singular way in which to commence a verse-"At that time Jesus answered." If you will look at the context you will not perceive that any person had asked him a question, or that he was in conversation with any human being. Yet it is written, "Jesus answered and said, I thank thee, O Father." When a man answers, he answers a person who has been speaking to him. Who, then, had spoken to Christ? his Father. Yet there is no record of it; and this should teach us that Jesus had constant fellowship with his Father, and that God spake into his heart so often, so continually, that it was not a circumstance singular enough to be recorded. It was the habit and life of Jesus to talk with God. Even as Jesus was, in this world, so are we; let us therefore learn the lesson which this simple statement concerning him teaches us. May we likewise have silent fellowship with the Father, so that often we may answer him, and though the world wotteth not to whom we speak, may we be responding to that secret voice unheard of any other ear, which our own ear, opened by the Spirit of God, recognizes with joy. God has spoken to us, let us speak to God-either to set our seal that God is true and faithful to his promise, or to confess the sin of which the Spirit of God has convinced us, or to acknowledge the mercy which God's providence has given, or to express assent to the great truths which God the Holy Ghost has opened to our understanding. What a privilege is intimate communion with the Father of our spirits! It is a secret hidden from the world, a joy with which even the nearest friend intermeddleth not. If we would hear the whispers of God's love, our ear must be purged and fitted to listen to his voice. This very evening may our hearts be in such a state, that when God speaks to us, we, like Jesus, may be prepared at once to answer him.